I mostly finished the nursery months ago, but haven’t posted because there was one last piece of artwork I wanted to hang. 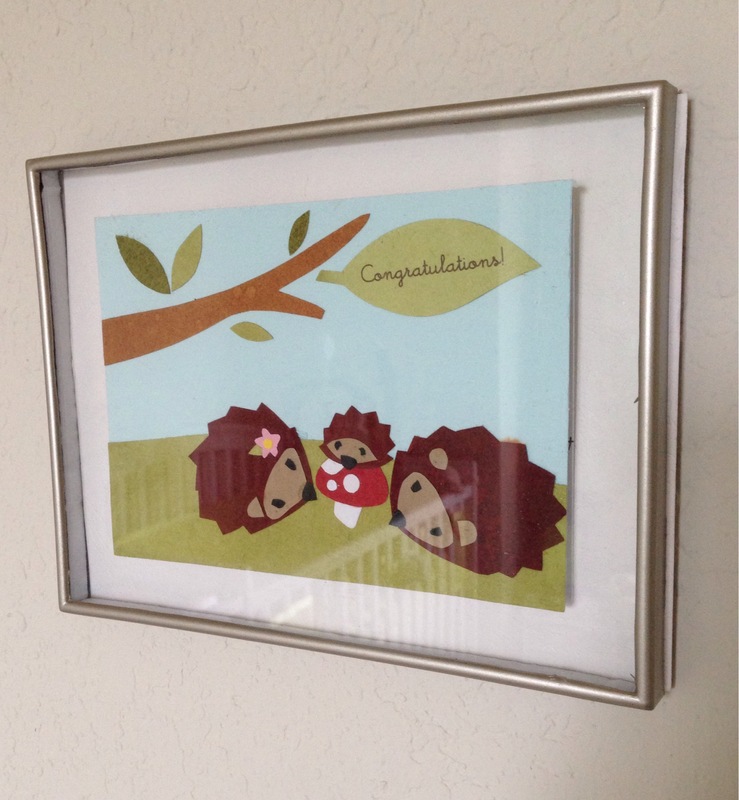 A friend sent a beautiful handmade card that I framed, but I had very limited chances to hang it because hammering into the wall when the baby sleeps is not a good idea. 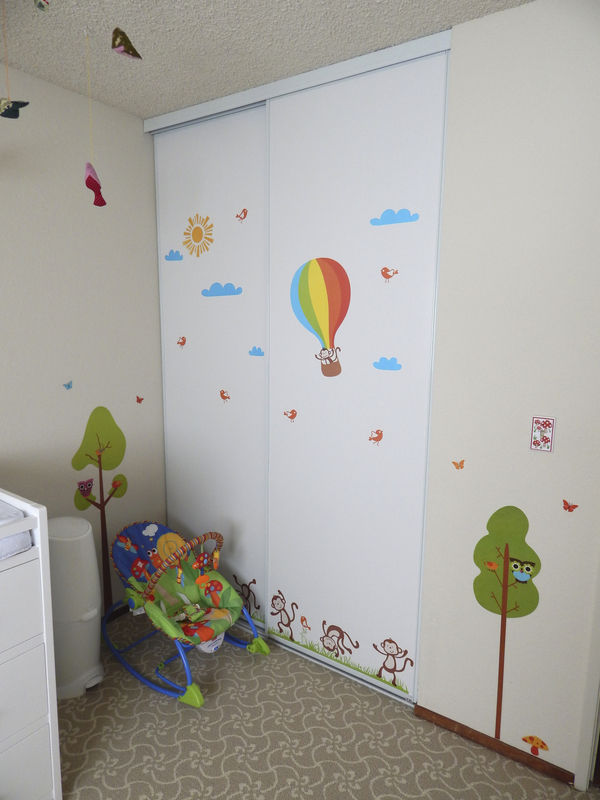 Most of the items in the room are handmade, modified or vintage, so that the baby could have a unique room (without too much expense). Here is an overview of the room as you walk in. The rocking chair is vintage, and I made the chair cushions. 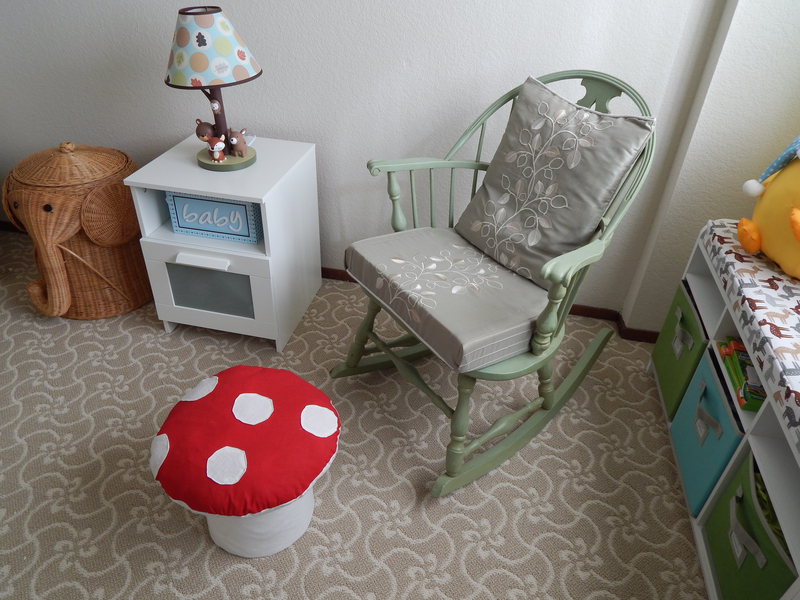 I also made the toadstool footstool. 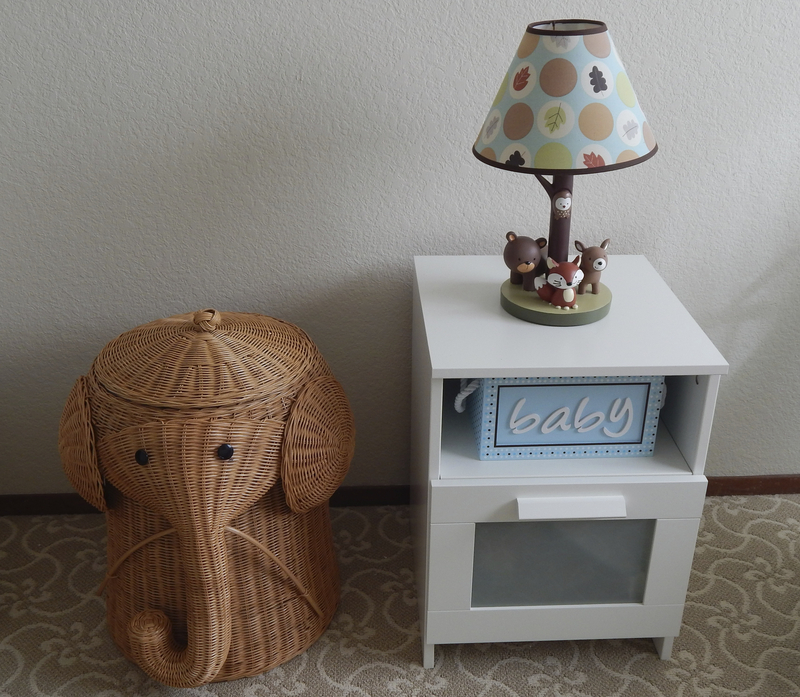 The nightstand is from Ikea, the elephant hamper from Home Decorators, and the Carter’s Forest Friends lamp and blue baby box were gifts. 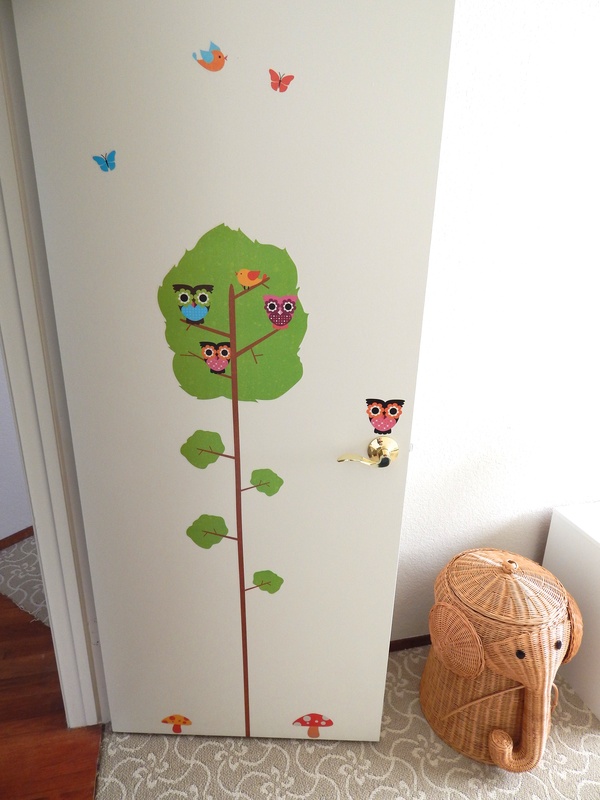 I used decals from eBay on the door, closet doors and walls. The wall art was made by me to spell out my baby’s name. 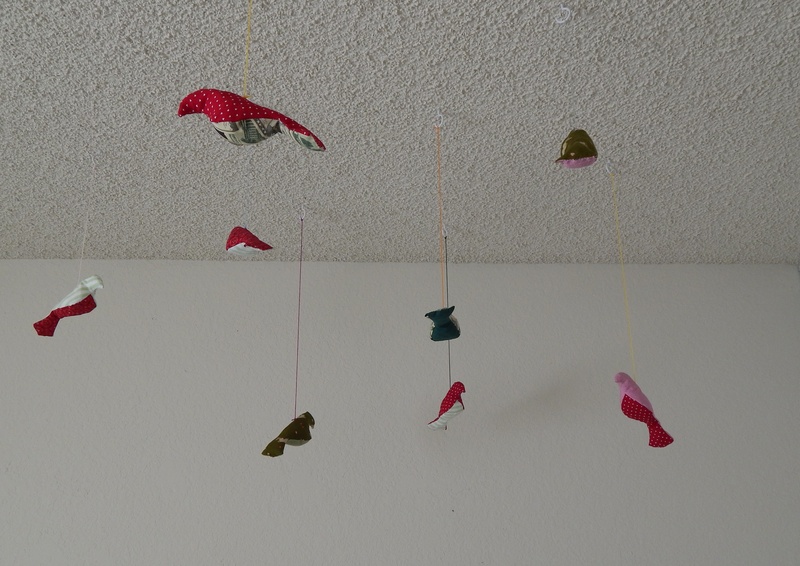 I made the fabric birds using scrap fabric. Originally, I had them all hanging on a large vine wreath, but it was so heavy I did not feel comfortable suspending it from the ceiling. 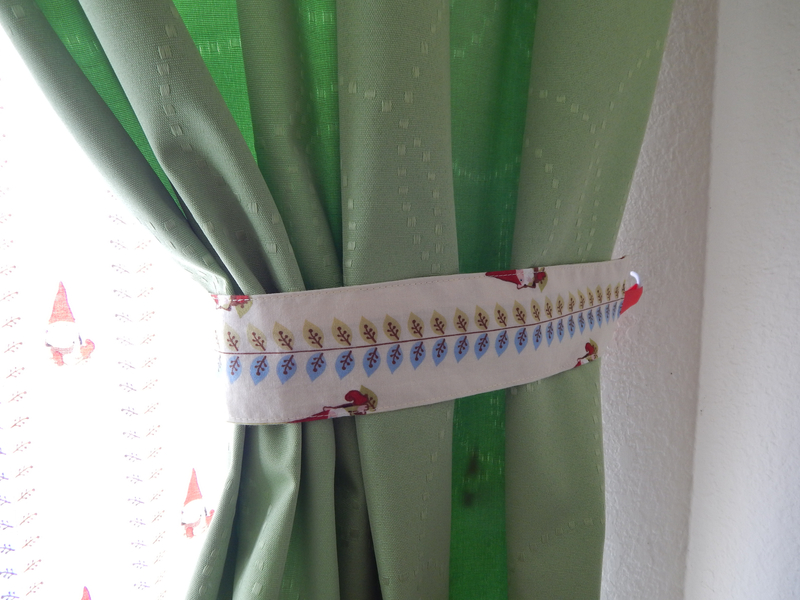 I got the pattern from Spool Sewing. 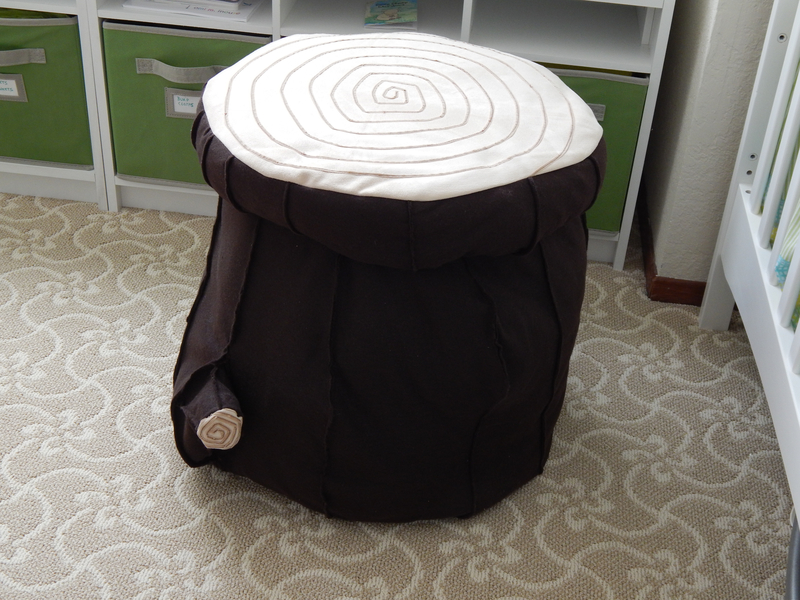 I made the tree stump ottoman, and should make a construction how-to post later on. 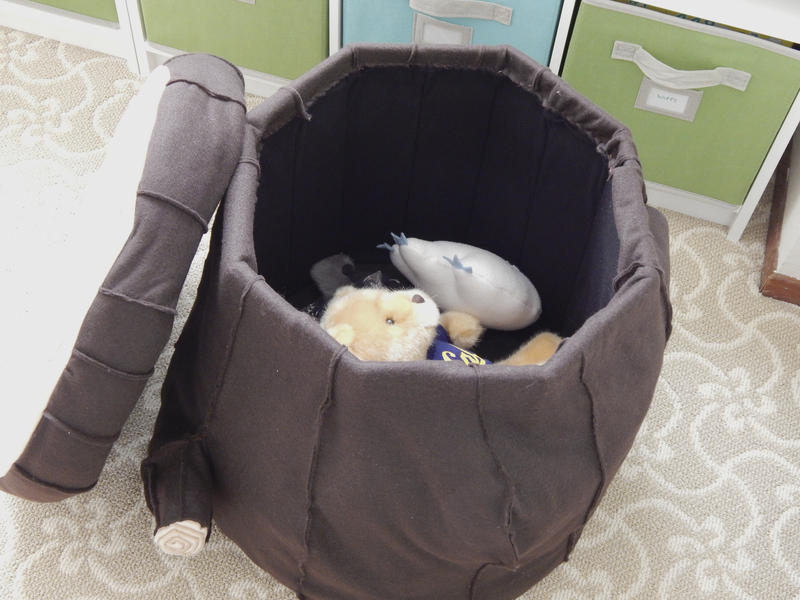 It works triple-duty as a table, extra seating and hidden storage for toys. The cushion covers and button tree pillow were sewn by me. 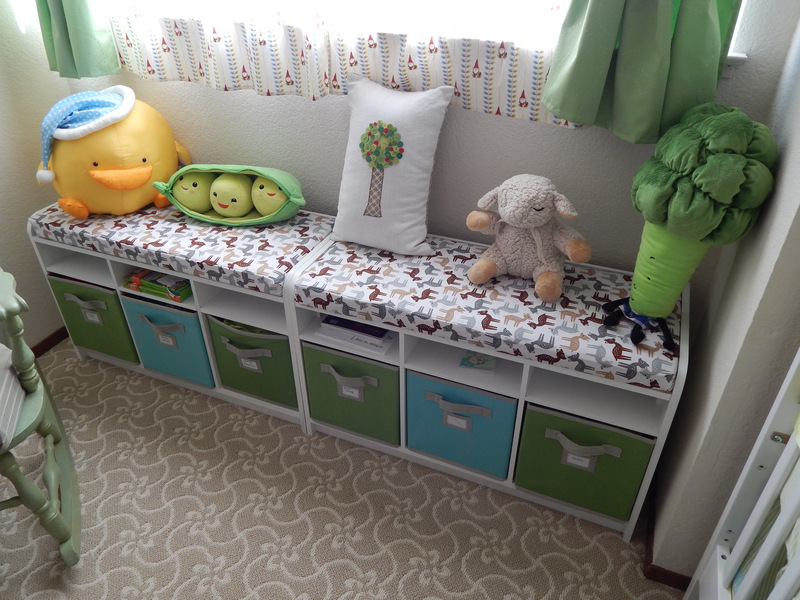 The Martha Stewart storage bench and fabric bins are from Home Decorators. 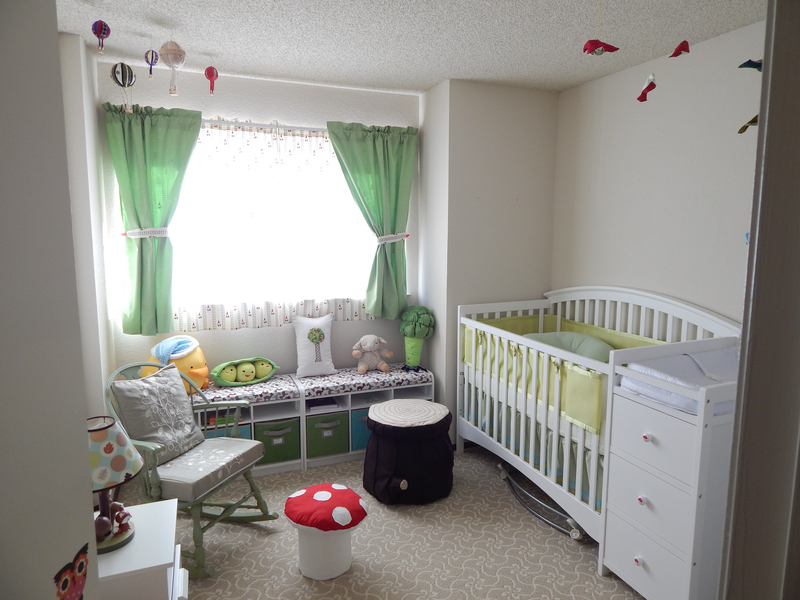 The convertible crib with attached changing table and dresser are from Target. 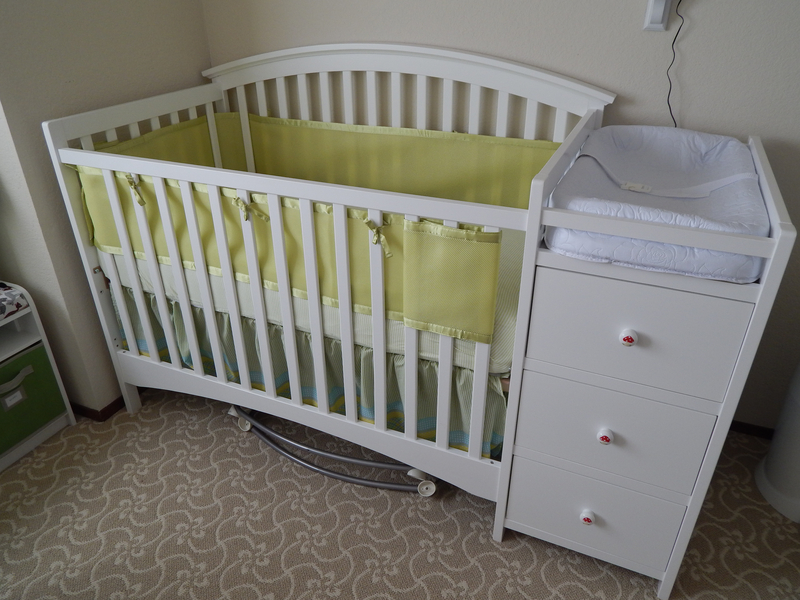 Later on, the crib parts reassemble into a toddler bed and full-size bed. 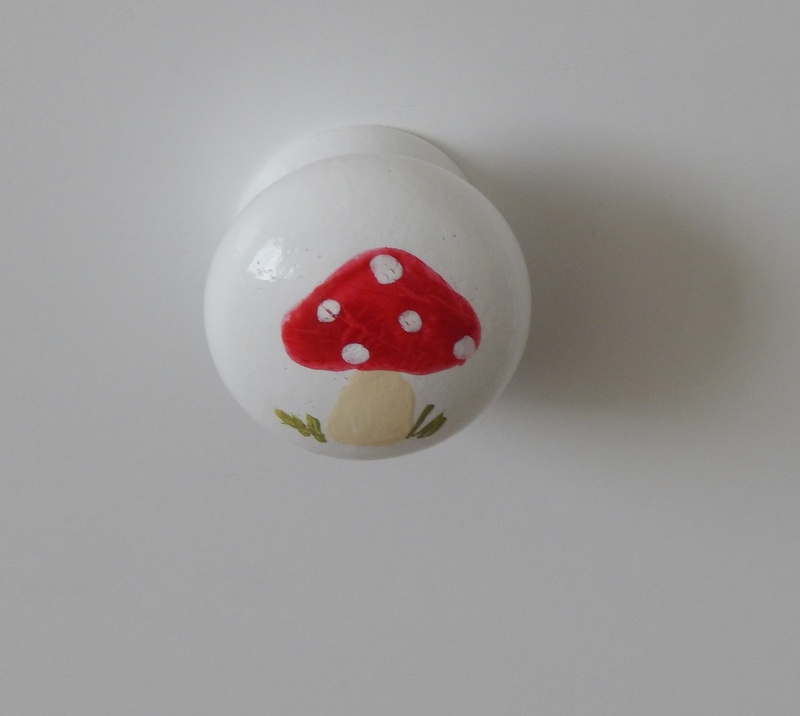 I painted the drawer knobs with mushrooms. 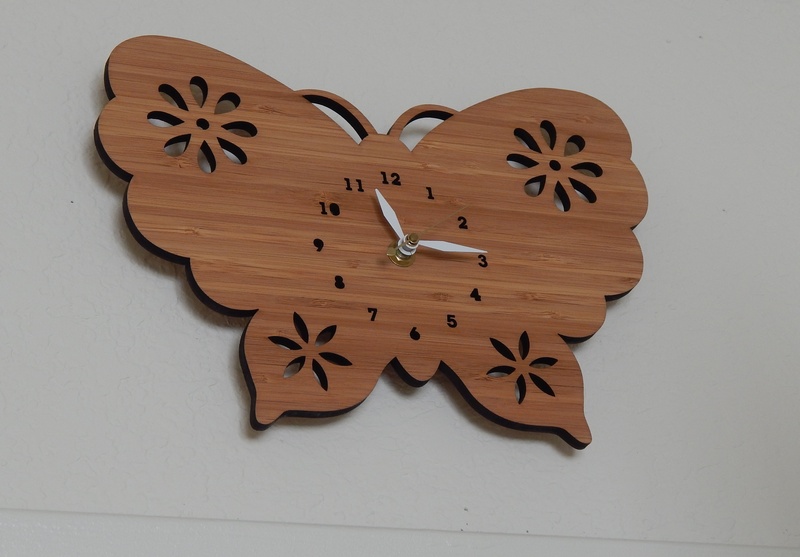 The laser-cut bamboo clock is from Decoylab and was used in my sewing room. If I was buying from them now I’d get the hedgehog clock for the nursery. 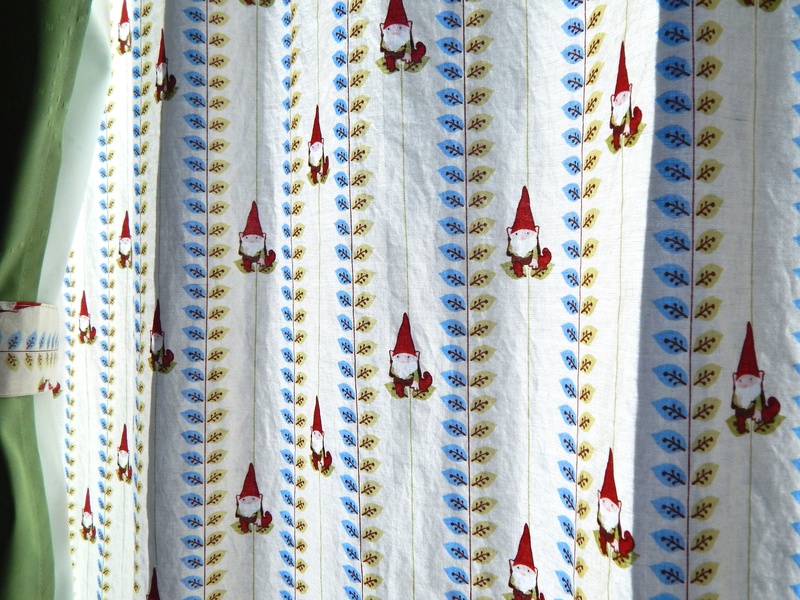 I made the curtains and tiebacks from gnome fabric. I love the print, but the cotton wrinkles so easily. I have a second set of green thermal curtains (purchased from Target and hemmed by me) so I can control the lighting in the room. 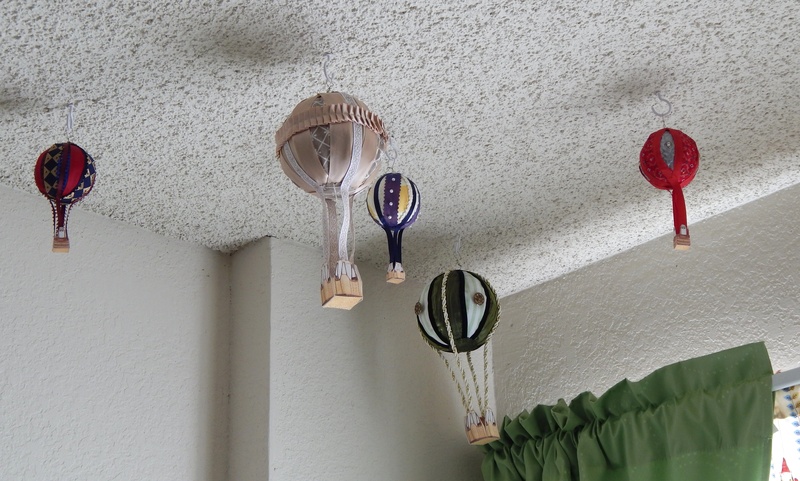 The hot air balloons in the corner were another craft project of mine. And finally, the card from my friend, which is made of different colors of paper glued to cardstock. 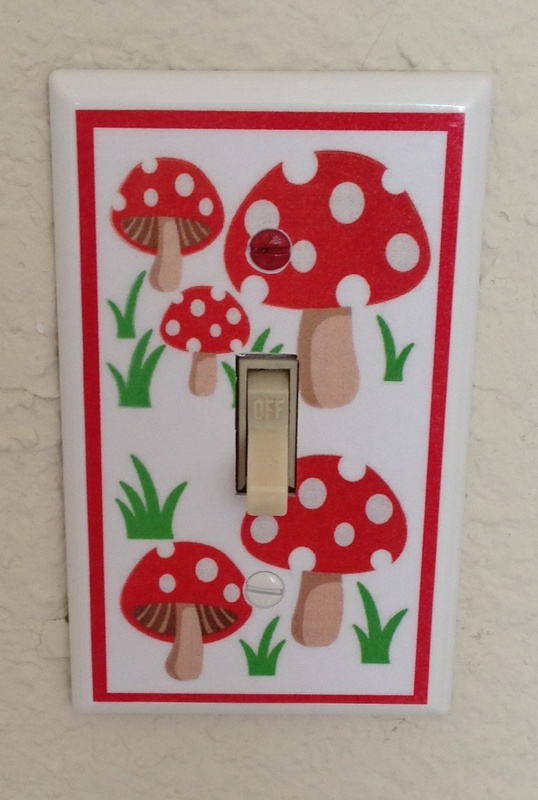 Posted in Nursery and tagged crafts, forest, home decor, mushrooms, nursery, woodland. Bookmark the permalink.